The Solo Blog Index built on last week’s big advance with an 11-point gain driven by Olfactarama which continued to roar back from recent downturns. IndiePerfumes skidded substantially while most other sites registered relatively small changes. 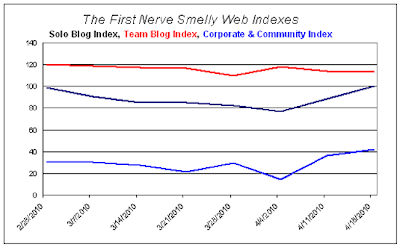 The Team Blog Index was off a point, but the Corporate & Community Site Index continued to spring back to life with a five point gain led by TheDryDown. 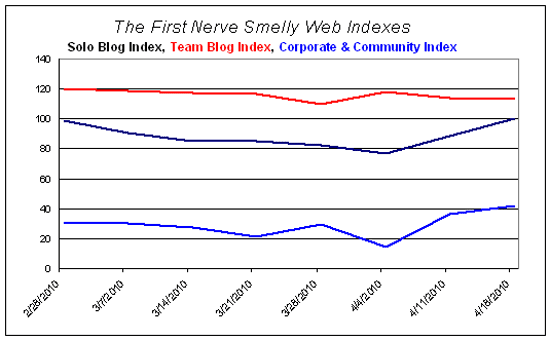 At the end of February, when things were looking bleak, commenter CarmenCanada—seconded by Nathan Branch—predicted a surge in the Smelly Web Indexes to coincide with the new fragrances launches in April. It’s looking like that was a good call. Hope you all made a killing in the SWI futures market! I've been so lazy about blogging. Kind of feel they're jumped the shark a bit. Trying new contact stuff. My FB and Twitter following is in the high numbers, and that's where I'm sharing most of my blurbs. Tons of sales that way, too. Uh oh. Guess that leaves me and the Stat Monkeys to chronicle the Twilight of the Bloggers. There's some kind of force field that keeps me away from FB. Deep down I just don't want to be Kip Drordy's friend. Or water his wallpaper or whatever. Twitter seems like texting for hebephrenics. But if it boosts your business I'm totally for it. I can see where Facebook and Twitter are much better vehicles for product/brand promotion than blogging. Blogging takes more time, and readers often expect opinions and ideas that don't jive very well with the end-goal of selling goods -- Facebook, however, is great at letting a seller post pictures and short blurbs that promote themselves and their etailing site. Twitter, too, though in a lesser fashion.